-Your purchase address must MATCH the NAME and ADDRESS on the valid driver's license or Utah state ID that you present in person at the time of pickup in January. -Photo ID is required. Out-of-state property management firms and timeshare holders are not considered locals. -The locals options in Park City are a thank-you to the year-round residents who are affected daily by the Festival preparations, traffic congestion, schedule disruptions, etc. -Utah does not allow PO Boxes on driver's licenses. Purchases listing only a PO Box address may be cancelled. -Locals MAY NOT select express delivery as a delivery option when purchasing any Festival pass, ticket package, or individual tickets. -Locals 10 Ticket Packages are limited to two per household. This includes spouses, roommates, domestic partners, relatives, pets, multiple personalities, etc. If you purchase a second Locals Salt Lake City Pass, your companion must also be a resident of Utah. -Passes must be picked up individually in person and the second person must also present proof of Utah residency (driver's license or Utah state ID). 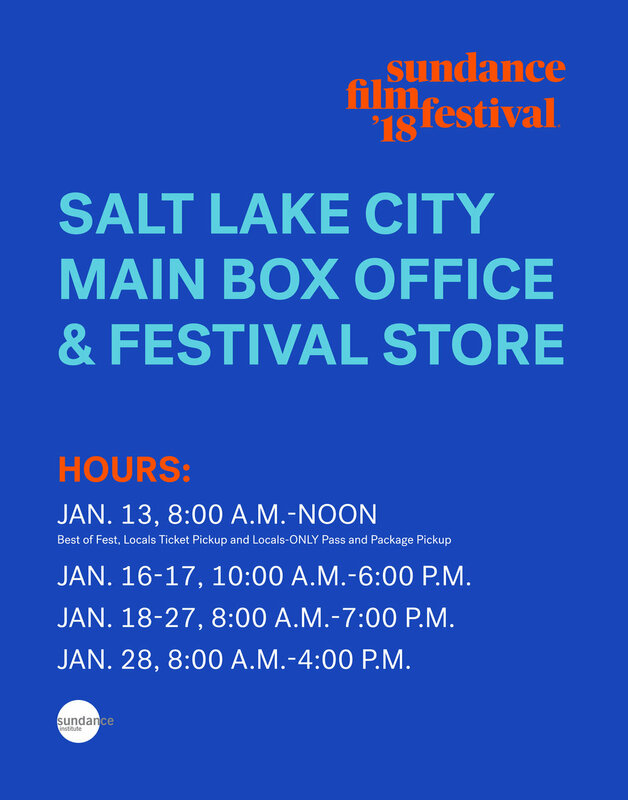 -Locals Festival pass and ticket package pickup will begin on January 13, 2018, from 10 a.m. to noon MT at the Pass and Package Office in Park City and the Salt Lake City Main Box Office and will run throughout the Festival. -You will select your pickup location for your pass/package at the time of purchase. -Pickup location cannot be changed after the time of purchase. Located on the 600 South side of Trolley Square, across from Weller Book Works and Coffee Connection.